You may not think about it every Sunday, Monday night and Thursday night that you’re watching your favorite NFL football team but an alarming number of pro athletes actually go bankrupt after their professional careers end. In talking with a few celebrities who have almost gone down that route, it’s not even ignorance that some may think. It’s not living beyond your means as a national celebrity, sometimes pro athletes and celebrities really get too busy to manage their money. They also get too busy to think about what happens afterwards. We’ve all heard the sad stories too, of people like Fantasia Barrino and other stars who have turned their finances over to someone less than qualified to handle such large amounts of money. Celebrities and pro athletes assume that everyone has their best interest at heart. Well former NFL star and entrepreneur Brandon Williams does. 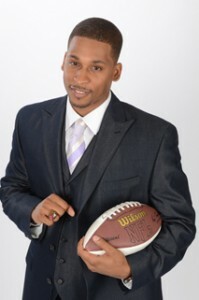 Williams, through his Brandon Williams Economic Development Corporation is trying to connect athletes and celebrities with entrepreneurism. He’s not talking about the kind where a celebrity quickly endorses a product and moves on. Williams is trying to connect entrepreneurs, startups, sports stars and celebrities in a new kind of ecosystem so that entrepreneurs can benefit from investment and athletes and celebrities have a plan for when their careers slow. One of Williams initiatives is Venture Draft, a startup and entrepreneur event, pitch contest and showcase that happened in St. Louis this past weekend. ABC Shark Tank Shark, Founder of Fubu and partner in Shark Branding, Daymond John, was one of the top level keynote speakers at the event. We didn’t raise enough money in our last crowdfunding leg to attend ourselves, but our good friend Scott Resnick in Madison WI led a group of 6 from Madison to St. Louis for the event. The first annual Venture Draft Conference was held in St Louis this weekend. The mission of the conference was to bring professional athletes, venture capitalists and technology experts face-to-face to create business opportunities (aka allow entrepreneurs to mingle with and teach current and former NFL players about technology). A tip of the hat to the Brandon Williams Economic Development Corporation: the Venture Draft was a success. Rarely do I experience a “wow” moment at a tech conference. However, this one was different. Maybe it was the personality of the highlighted speakers (who attended every event) or the charm of St Louis, but there was something special about Venture Draft. My “wow” moment came right after I had the opportunity to bounce business expansion ideas off keynote speaker Henry Wong of Garage Technology Ventures at a local cigar bar. As I was walking out of the bar to a sponsored after party, Jim Sorgi struck up a conversation about his future with the Colts and time on Gilman Street. Wow, this conference was pretty cool. Continue here to the Hardin Design & Development Blog for the rest!